Order your prescribed lenses online, and get it shipped directly to your home or office. Call us at (972)-910-8829 today. Welcome to Today's Vision Las Colinas in Irving. 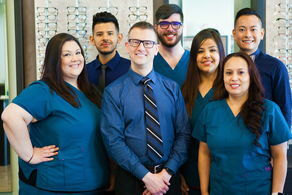 Dr. Paul Hayter and the Today's Vision Las Colinas team strive to provide the best in optometry services. We invite you to browse our website to learn more about our optometry services and join our patient family by scheduling an eye exam appointment at our Irving office. Today's Vision Las Colinas is a full service eye and vision care provider, accepting both eye emergencies as well as scheduled appointments. Patients throughout the Irving area come to Today's Vision Las Colinas because they know they will receive the personal attention and professional care that is our foundation. Dr. Hayter and our team are dedicated to keeping our patients comfortable and well-informed at all times. At Today's Vision Las Colinas, we will explain every exam and procedure and answer all of our patients' questions. Additionally, at Today's Vision Las Colinas, we offer vision financing options and will work with vision insurance providers to ensure good eye health and vision care for all of our patients. 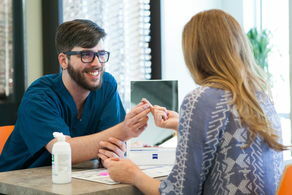 Our one-on-one approach to optometry makes Dr. Hayter and the Today's Vision Las Colinas staff the eye and vision care providers of choice in the Irving area. 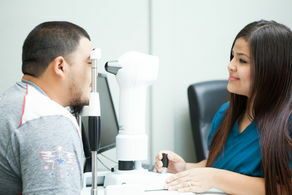 Our Irving optometrist offers the following services: complete eye exams, contact lenses, glasses, glaucoma testing, and pre- and post-operative care. For a complete list of services, visit our services page or call our Irving office at (972)-910-8829. 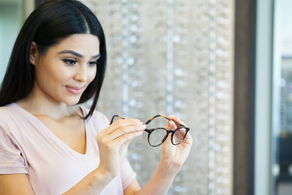 At Today's Vision Las Colinas, we are dedicated to providing high-quality optometry services in a comfortable environment.Call us at (972)-910-8829 or schedule an appointment today online. "Stopped by to pick up my contact lenses that Dr. Hayter had kept on hold for me. So they moved from their previous office from McArthur to this brand new location and can I just say WOW! The new location is stellar! Looking forward to my next eye exam and being able to shop for new glasses as it's now in house! The office is always making improvements for the benefit of its patients like myself. Much appreciated to the amazing staff and excellent and consistent customer service!" "I highly recommend. Very warm, welcoming and professional atmosphere by both the Doctor and staff. Dr. Hayter is very thorough and detailed in his examination. Dr. Hayter is updated with the latest technology available." "This place is the best! Everyone is kind, patient and professional. I've been going to Dr. Hayter as long as I can remember and will keep it that way. Now that they are in their new location, it's not only very clean, but you can get your exam and order your contacts and glasses all in one place at the same time! I love the fact that I can have a Saturday appointment and they call to remind me the day before AND text me the address and appointment time, just in case! I highly recommend everyone to come here and visit Dr. Hayter and his wonderful staff!!" "I was able to get an appointment for the same day. Dr. Hayter's staff was super friendly and Dr. Hayter was awesome. He was very caring and listened to what I said. I was in and out of there in about 40 minutes. It was a great experience and I would recommend him to anyone." "I went to Dr. Hayter on 06/28/2017 for regular eye check up after I found the good reviews about him. I was glad to find out it was all true. Dr Hayter and his team are really great at what they do. Thank you Dr. Hayter for taking time to check my eyes in detail and prescribe me the perfect eye glass. Also, thanks to Ashley and Tim for helping me with my eye glass prescription and getting it on time. Now I want my family to have this great experience too. Highly recommended!!!" "I had an awesome experience at Dr. Hayters office during my last exam. The staff was friendly and efficient. The office was very comfortable and the wait was minimal. The pre exam which I usually dread was painless due to assistant being very patient and knowledgeable. Dr. Hayter took the time to ask me enough questions to make sure I got exactly what I needed and got me in a pair of contacts that are comfortable. I won't be waiting too long in between my exams anymore since I have found this office with such a great staff and doctor. I would highly recommend my friends and family to Dr. Hayter." "Dr. Hayter and his team were able to fit me in for an appointment last minute. The entire experience was comfortable, quick and everyone was very friendly, which really put me at ease. I appreciate their patience and have nothing but great things to say about my experience. Thanks so much, Dr. Hayter!" "I have nothing but great things to say about this clinic , the staff are super friendly !! Which to me is always a must ! The clinic is very neat and organized and they take care of you in a quickly manner. This was my first time coming here due to it being closer to me and Doc Hayter will definitely be my new optometrist moving forward I just loved the services!" "Always a pleasure coming to see Dr. Hayter. I was overdue on my eye exam and thankfully they are open on saturdays which got me in for my routine visit. The Staff are always fast and courteous and I am pleased with my recent visit." "Great experience. The words can't describe my experience here. Everyone was so helpful and nice and they genuinely care about my concerns. I ask a lot of questions and they were more then happy to answer everything! Thank you!" 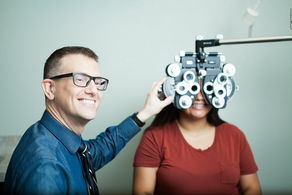 "Great customer service, fast and convenient procedures and very detailed eye exams. I have been going to his office for 16 years and each time I only spent 15 to 30 minutes. I could always do that during my lunch breaks and get it done without having to take a day off." "This office staff and Doctor are great. I had many questions and concerns and the Doc. made sure to answer my questions and help ease my concerns. The Doc was knowledgeable in my condition and his staff is very nice and friendly. Will recommend him to my family and friends." "As a new patient, I was welcomed by Dr. Heyter with a huge smile and a warm heart. As soon as I walked into the office, the personnel were delighted to see me. The process of filling out paperwork and getting me back was surprisingly very quick. Dr. Heyter's office is on top of its game. I was in and out of the office in 30minutes. Thanks to the staff for an amazing visit. I will definitely be recommending this office to others!" "Friendly and welcoming staff. I appreciate how Vanessa explained all the exams we did. Tim did a great job helping me find a pair of glasses ...there was no pushing me on buying extras that I didn't need. Couldn't ask for a better Customer Service!" "Excellent professional staff, clean modern office, attentive accurate medical advice. Prescriptions that work. Better than normal wait times. What else could you ask for? Dr. Hayter’s office is a well-oiled machine Bottom Line: This is where you go if you need to be able to see well, this is where you go to get good prescriptions." "The team at the Today's Vision Las Colinas are highly skilled professionals taking pride in taking care of their patients. In the greatly equipped exam room they conduct very detailed exams, explaining all the steps along the way. I have full confidence in Dr. Hayter's skills and experience. I recommend his practice to everyone that is serious about their vision and value highest level of service." "The service was fantastic all the way from calling to set appointment to when I left. The staff was extremely polite and made me aware of everything so there were no surprises. Dr. Hayter was awesome. He explained everything to me in terms that were easy to understand and was very informative. Definitely a recommended location."